You'll be £12.99 closer to your next £10.00 credit when you purchase Airfields And Airmen Of Ypres. What's this? This is the first book in the Battleground Europe Series discovering the airfields and airmen of the Great War. It is sometimes forgotten that the Wright Brother's first flight took place only in 1903; yet fifteen years later the Royal Air Force had over 20,000 aircraft of all types including night bombers.This book takes the reader to the sites of the airfields used by the Royal Flying Corps in the vicinity of the Ypres Salient. These fields were basic in the extreme compared with airbases of WW2 and today; flattish ground hitherto used for agriculture purposes trampled down by men and vehicles. It was here that the primitive aircraft were based, surrounded by a tented camp and temporary buildings.Yet out of such places the great legendary air aces of the war operated. The book also reveals the locations of many killed whilst engaged in combat flying.Pilots from other countries (French, German etc) are also covered. 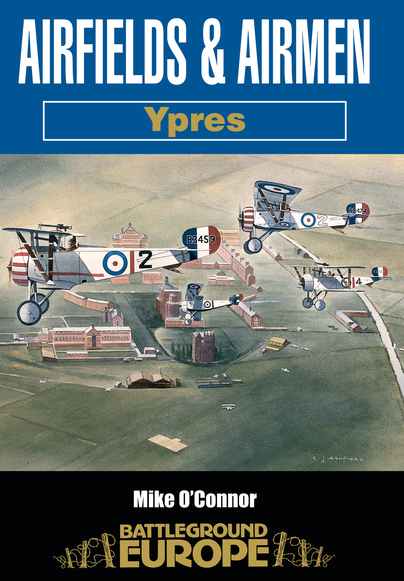 This book combines interest in airfields with battlegrounds and presents a pleasing 'then and now' format account of the aerial war of the Ypres area. Much use is made annotated air-to-ground photography related to personal anecdotes - these two elements combine to add life to already-vibrant stories, whether you are touring the sites or sitting in your armchair. Completing one or all three of the well-defined tours in this book would enrich any traveller's experience. Even if your travel opportunities are limited to your back porch, this book makes for interesting reading and gives you an excellent feel for the battles the raged above Ypres. The historian will learn a good deal from it and the battlefield visitor will find it a fine guide to keep in the car while travelling in the area.